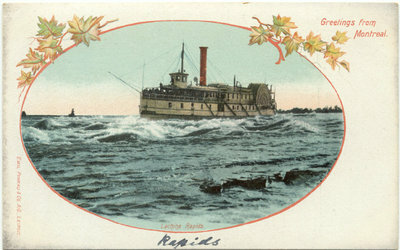 Coloured postcard of unnamed steamboat running the Lachine Rapids. The name on the paddlewheels is missing. It is derived from an earlier picture of the Richelieu and Ontario Navigation Company steamboat PASSPORT taken by Notman. The absence of the steamboat's name from the paddlebox is probably because the PASSPORT was renamed CASPIAN in 1898 and by 1900 was no longer in the service of the R & O, having been purchased by the Lake Ontario and Bay of Quinte Steamship Company (owned in part by the General Manager of the R & O, C. F. Gildersleeve). The postcard has an undivided back.